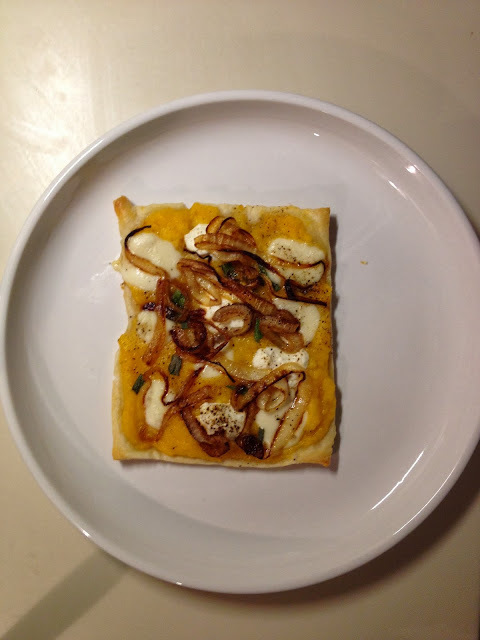 heather & olive: butternut squash pizza. Ever since I went to Maine and had an amazing meal here, I've been wanting to replicate their butternut squash pizza. So, when I made the Beef Wellington the other night, I cooked a big batch of butternut squash to eat alongside and planned to use the extra to make into a sauce. With the leftover puff pastry, I was in business. 1. If using puff pastry, preheat oven to 400 degrees. 3. Spread the butternut squash sauce on the pastry, and add dollops of ricotta and slices of mozzarella. 4. Add the caramelized onions to the top of the cheese. 5. Thinly slice the sage (less is more here) and sprinkle on top. 6. Cook for 12-14 minutes, or until the pastry is puffed and slightly brown and the cheese is melted. And ta-da! You're left with an easy and tasty vegetarian meal. Day-um! Well done, HMC -- looks just like the restaurant's! OMG that looks delish-- I will be making that next week! Thanks, girl!